Martin Fields and NaCumbea were time travelers working for a group of extra-dimensional entities and they used the provided temporal suits to correct timeline anomalies. The pair looked up to see a three meter tall figure step around a non-existent corner. “Time traveler?” Martin hazarded a guess. “Clue to what?” Though more experienced than Martin, the alien still frightened NaCumbea. I wrote this for the FFfAW Challenge for the Week of February 6, 2018 hosted by Priceless Joy. The idea is to use the image above as the inspiration for crafting a piece of flash fiction between 100 and 175 words long. My word count is 174. 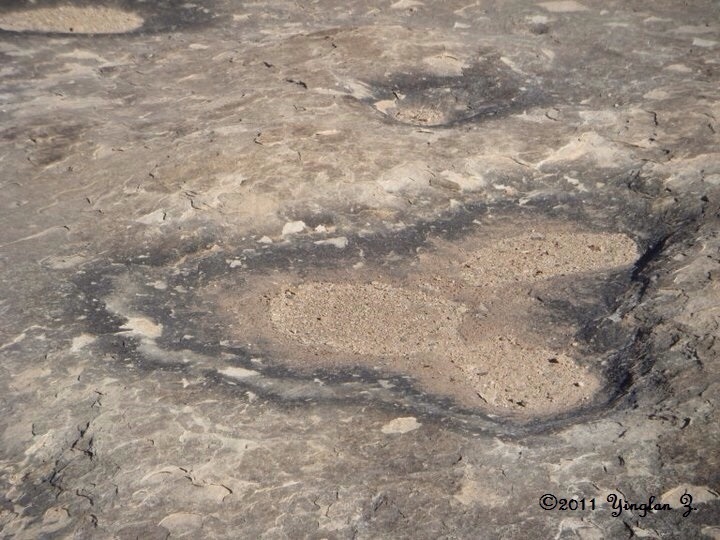 The image reminded me of a fossilized dinosaur footprint but not of any dino that I’ve ever heard of. More like an alien footprint. So I sent my two time travelers, Martin Fields and NaCumbea, last seen in the short story I’m Leaving You For 1966, Dear, to investigate (why invent new time travelers when you already have a couple on tap?). I decided to make aliens responsible not only for the dinosaur extinction event of 65 million years ago, but also for seeding the biosphere with the basic template for modern human beings (I’m sure this idea must have been used before). In order to understand what Martin and NaCumbea would experience, I looked up the climate for that period in the article The Beastly Climate which details climatic changes in Australia (where my adventure takes place) from 145.6 million years ago to about 20,000 years in the past. I also looked at Happenings During the Cenozoic (65 Million Years Ago to Present) and What is the Average Global Temperature Now? to get a comparison between what the climate was like 65 million years in the past to the present. As it turns out, it’s a good thing the temporal suits can be set to isolate the wearer from the local environment since it seems the dinos liked it hot. Very interesting James! The men meet up with a time traveler alien. Very creative! Great story! Actually NaCumbea is a woman (I guess it wasn’t obvious from the context) but yes, although the alien has time scanning but not time travel capacities. Thanks. Sorry, I guess I got it wrong. No worries. I didn’t make it explicit. The alien would have to have time-travel capability as well, in order to become physically present to leave the footprint. The alien existed 65 million years in the past but also has the capacity to see the timeline. Basically, it can see the consequences of its actions even millions of years across time and has engineered the rise of the human race in order to make first contact with us. Otherwise, Earth would not have had an intelligent, sentient species. Why they did all that, the story doesn’t explain. Hmmm… He’ll find out… Will I? Will there be a sequel? Let’s home they’re friendly. Maybe they bred us as livestock. Iain. I hope these aliens we’ll encounter next year are smart enough to do something about the current occupant of the White House if he’s still around by then. Actually, I made a flippant remark about the aliens having seeded Earth with human DNA for the express purpose of harvesting us as food tens of thousands of years in the future so I think I’ll make that the official sequel to this tale. So how to Martin and NaCumbea solve the problem since that seeding happened a long time ago (that part’s not a problem for time travelers) and they can see into the time stream, so anything they plan to change things will already become known? I started to write that story a few moments ago, but I want to retire this series since the relationship between Isis and Martin is substantially similar to that between Raven and Jonathan Cypher in another series and I would like to develop the latter series. Long story short, this isn’t a problem needing solving. The aliens should have come back sooner. By now, all of the western societies have made their human beings terribly toxic with heavy metals and other substances, so a lot of the human race is no longer edible. It’s sort of a “non-mission” which is another reason not to write it, however I “know” what happened because I’m the creator of that universe. Now, *there’s* an epilog for you — the aliens make contact, find out how toxic we’ve become, and go away because their plans to create a food product from a sentient species have failed. Maybe they even become infested or infected by some bacterium or virus or parasite to which we have commonly become hosts, but of which they become aware only too late to protect themselves from it adequately, and it devastates their population. True, I could always “H.G. Wells” the thing. Ahh, yes — I wasn’t even conscious that I might have been drawing upon Wells’ ending in “The War of the Worlds”, but you’re quite right. On the other hand, not everyone has been contaminated with heavy metals or pesticides, so their potential for toxicity would vary. Some of us have been quite selective about what we have eaten all our lives, and we might be quite tasty. Nonetheless we would still want humanivorous aliens to think us unpalatable, and give up any notion of harvesting us as foodstuff. Can’t wait for 2019 to come and the secret to be revealed 🙂 Intriguing sci-fi with excellent research as usual James. Since it’s fiction straight out of my imagination, I suspect 2019 will come and go and there will be no aliens. Sorry about that. I’d better stock up on sun-tan lotion! Probably need more than that, Keith. I’m not sure I want to know what we were “planted” here for! Maybe it’s for the best, Nona. Thanks.